Salesforce Marketing cloud earlier known as Exact Target provides digital marketing and analytical software and services. Salesforce blazed a trail by creating marketing cloud and a new era began in the digital marketing world which was struggling with various problems like retrieving customer information from social networks, managing huge amount of content to generate data for metrics, all conversation between organization and customers not available at one place etc. Salesforce marketing cloud being one platform to integrate all social programs and data, not only resolved these problems but provided many other benefits to the organization. Let us walk through some of the benefits an organization gets on using Salesforce. Salesforce organization provides 6 platforms which enables an organization to manage its digital marketing effectively. Salesforce Journey builder offers a very robust customer management tool, with super integration capabilities. It enables users to setup automated response for varied actions from customer’s end. It empowers the user to incorporate sales and service activities into the journey by defining specific goals, measure CTRs, timing, channels, conversations and more. This service gives the organization a vantage point as it can give personalized service to the customer based on customer’s reactions. When used properly it enables sales and service cloud insights available to the organizations, empowering them to deliver smarter and consistent customer experience. Before Audience builder came into being, consolidating data from different sources was a nightmare. However Audience Builder has proved to be a game changer. It provides single view and filtering of customer data from different sources like Sales cloud, Service Cloud and other data sources. It also enables the user to create distinct groups of people to send emails basis their defined needs. It helps the organization to provide personalized communication to customers. Personalization Builder provides user the access to use predictive analytics and predictive modelling. It is a powerful tool for the user to set new standards in customer experience. It access the customer’s activity history and predicts future actions. The marketing cloud then allows the user organization to deliver a customized user experience based on this knowledge. The tailor made content across all channels gives the organization an edge over other competitors. With Salesforce Marketing Cloud comes the content builder which simplifies content management for organizations. It is a powerful cross channel content management tool that allows the user to consolidate images, documents and other content in one location. With the user friendly drag and drop interface, user can create content once and reuse it different places. It comes with complex algorithms to deliver best content for each customer. This in turn enables organizations to give enhances customer experience with lesser efforts. Analytics Builder empowers the organization to have deeper understandings of customer behavior across different channels. This understanding helps valuable inputs in setting and achieving marketing goals. Analytics builder enables the user to create graphical representations of reports and emails which eventually helps organizations to understand customer status for each campaign. Needless to say this gives fuel for thought for ensuring happier customers and leading to organization growth. Data stored across different systems is the backbone of any digital marketing plan. Marketing cloud connect merges the digital marketing capabilities of marketing cloud with other tools of Salesforce like data management, segmentation and campaign management. With access to all data in one place user can trigger activities that connect communications across Salesforce Sales cloud, Salesforce Service cloud and other products. 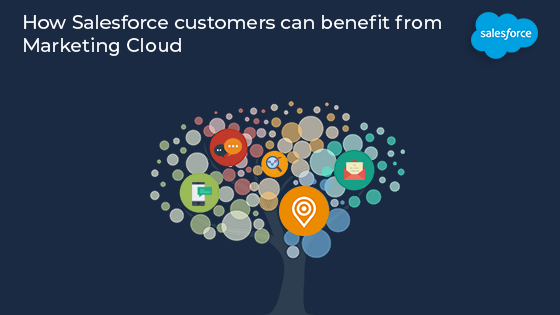 This ensure consistent branding and engaging customers and hence drives more leads into Salesforce.